I loved it, and I’m sure you’re going to love it to. You can read my review after the blurb. I swallowed back a comment. I was tired of hearing that I was going to get better. Was I doing better? Yes. Was I going to suddenly wake up one day and be better? No. Sutton is a woman that is going through a lot… a whole lot. She’s a widower with a single kid, and she’s the Wrights baby sister. She is interested in getting it together but she doesn’t know where to begin, and sadly she doesn’t find the support she really needs in her family or friends. They all pity her and she can’t handle their feelings plus hers… that is, until she realizes that there’s someone that has always shown her support since her husband died. No one had looked at me like that in a year. With something other than pity. With something other than sadness. This was…wrong. It was wrong, right? No, it was so very Wright. David is exactly what Sutton needs. Someone decided to give her unconditional support, and that really cares for her. He is new to the Wrights. Moved to Texas some time before Sutton husband dies, and he is the CFO of her family’s company. But one thing we know from the beginning, David is completely in love with Sutton and he wishes he met her in a better moment and could do something about his feelings for her . I was ready to live again. I wasn’t ready for…that. Whatever that was. Sutton has been mourning her husband for a year, and she’s ready to live again. She’s twenty-four, has a beautiful two-year-old, and so many reasons to enjoy her life. After deciding that she’s ready to move forward, it doesn’t take her much to see that David has been there for her all along, and that he was willing to be whatever she needed him to be in order to give her love and support. It took me another second to turn away. To not overanalyze what had just happened. To accept that this was okay. That I had misjudged David, and he had no interest in me other than as a friend. And I had no interest in him…either. As the first firework burst in the sky, I wondered how much of that was a lie. Lately, I have really enjoyed standalones. Reading about a couple in a single book is really practical and convenient. But, once I knew that K.A. Linde was ready to tell us about Sutton’s story it didn’t surprised me that she needed more space to write about her. There’s so much going on in her life, so many things that she needs to resolve. Getting over your husband’s death, caring for a child on your own, getting over your family’s sadness for you, accepting love once again… And in this first instance of her story she does so beautifully. This wasn’t just a simple kiss. It was a totally new adventure. The start of something inconceivable and utterly unique. This was a new first kiss. A new first. I know you’ll enjoy this book as much as I did. 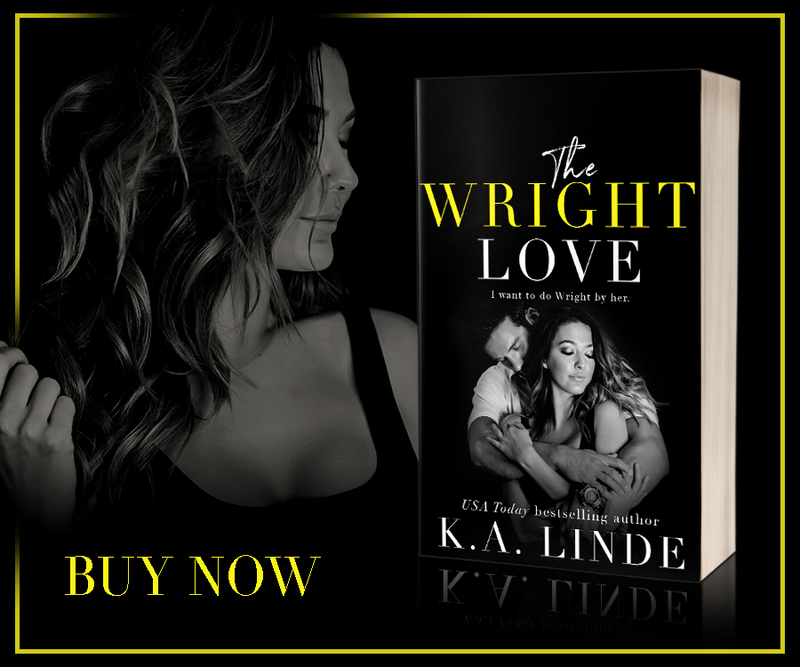 I’ll read The Wright One as soon as I can because I can’t wait to know how David and Sutton resolve the many issues they found in the first book of this duet. Get your copy today! Sutton and David’s love is a sensational story.